A challenge that confronts all readers and writers of historic fiction is that at some stage money and its value, compared with that of today, will raise its head. We know that the purchasing power of money in the past was a multiple of what currency of the same face-value would worth today. For long periods in history – and here I’m talking primarily of the United Kingdom, though the same was true to some extent elsewhere – inflation was low and wages and prices relatively stable. In Britain the really spectacular drop in the purchasing power of the currency unit – the Pound – has only occurred over the last half century. A 1964 Pound Sterling – 20 Shillings – worth having! I can give a personal example: in 1964, during my first long vacation from university, I took a job as a barman in a London public house. I got my accommodation and meals free (and the latter were excellent because I ate in the attached restaurant) but above that my pre-tax pay for a 66–hour week was £7.50. This weekly figure should be compared with the £ 5.60 per hour legal minimum wage for an 18-year old, in Britain today. I might add that I did not feel poorly remunerated. I allowed myself £1.50 a week for books, movies, theatre, underground fares for museum and gallery visits and meals in “caffs” on my day and a half off. I saved the remainder for travelling in Europe at the end of my eight weeks in the bar. Beware, Mr.Bingley! The Bennet girls have set their sights on your four or five thousand a year! If the problem of assessing the value of money as recently as the 1960s is a problem, then it is greater still the further one goes back in time. What, for example, would a pound or a dollar have bought in 1900, 1850, 1800? In Jane Austen’s Pride and Prejudice Mrs. Bennet describes Mr. Bingley as “A single man of large fortune; four or five thousand a year. What a fine thing for our girls!” But how rich in fact was Bingley and what would he be worth today? A useful insight is gained if one can find rates of pay for professions then with their practitioners today. One assumes that e.g. a doctor in Victorian times would have an expectation of a roughly similar standard of contemporary “middle-class living” as a doctor today, making allowances for differences in housing, transportation etc. etc. It was for this reason that I was recently interested to come across a very comprehensive summary of rates of Pay in the Royal Navy in the mid-1890s. It is especially valuable in that the same rank-structure is almost unchanged between that time and the present, even though titles may differ. At the top of the hierarchy came the Admirals, ranging from £1095 per annum for a Rear Admiral to £2190 for an Admiral of the Fleet. Extra allowances to cover expenses such as “table money”, an allowance in lieu of a servant, etc. could add significantly to this – in some cases even doubling the basic salary. 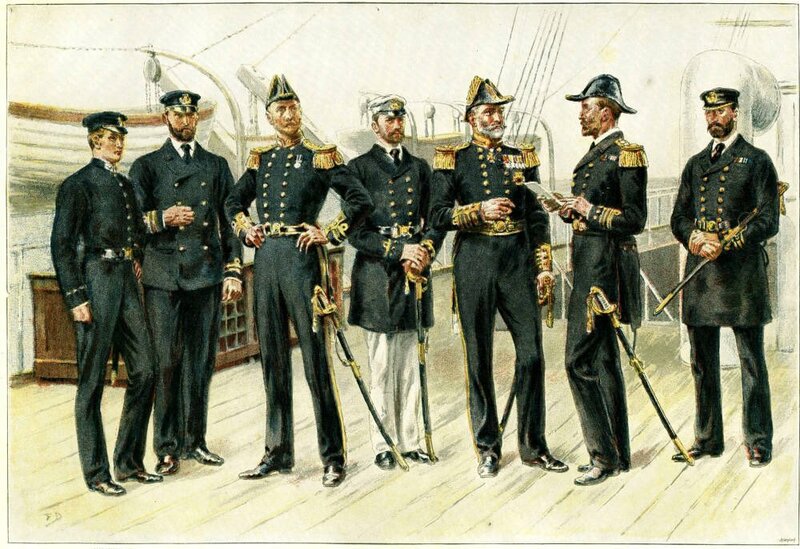 Naval Captains – comparable in rank to Lieutenant Colonels in the Army – did not do so well, ranging from £410 to £602, depending on seniority. “Extras” could range from £91 to 125. Commanders, equivalent to Army Majors, earned £365 per annum and Lieutenants with seniority could reach the dizzy height of £225. Midshipmen received only £13/18/9 (Thirteen pounds, eighteen shillings and ninepence – at this level the pence started to get important). Cadet s fared even worse – £18/5/0 per year. Engineering officers were still not fully accepted as proper officers (or indeed Gentlemen) in the 1890s and this was reflected in pay scales. An “Engineer” – note lack of formal title such as Lieutenant – was on a range of £273 to £219, a “Chief Engineer” up to £401 and at the pinnacle of seniority and responsibility the Navy’s “Chief Inspector of Machinery” would receive £638. The poor remuneration for engineers at the higher levels is all the more surprising since the Navy was at this time in the midst of unprecedented technical innovation. Medical officers were graded in order of seniority as Surgeon (£209 to282 per annum), Staff Surgeon (£383 to 438) and Fleet Surgeon (£492 to £602). At the top of the medical organisation the “Inspector General of Hospitals and Fleets” had a salary of £1003, generally similar to a Rear Admiral’s. One assumes that these salaries were roughly similar to what these professionals would expect in civilian life as otherwise they would have not chosen service in the Navy. Warrant Officers – Gunners, Boatswain and Carpenters – had pay ranging from £100 to £ 164, dependent on seniority. The big drop in pay came below this level. 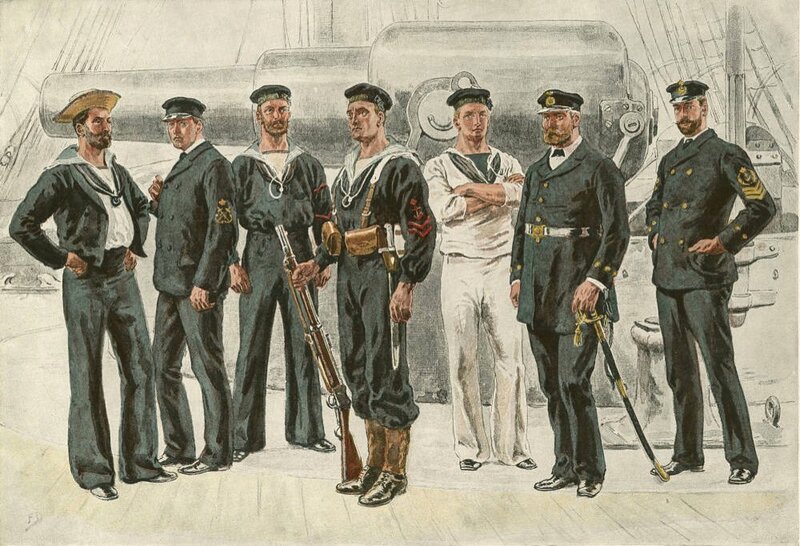 A Chief Petty Officer – in many ways the backbone of the service and on whom much of the efficiency of a ship would depend – could earn up to £57 maximum and a First-Class Petty Officer’s range was £39/10/10 to £44/2/1 – the shillings and pence were worth having. Further down the scale the Ordinary Seaman’s pay was £22/16/3 per year, but would advance to £28/17/11 if he were rated “Able”. “Boy” – a formal rank at which young men were recruited – started at just over £9 per annum and could increase by another £1 as seniority was gained. 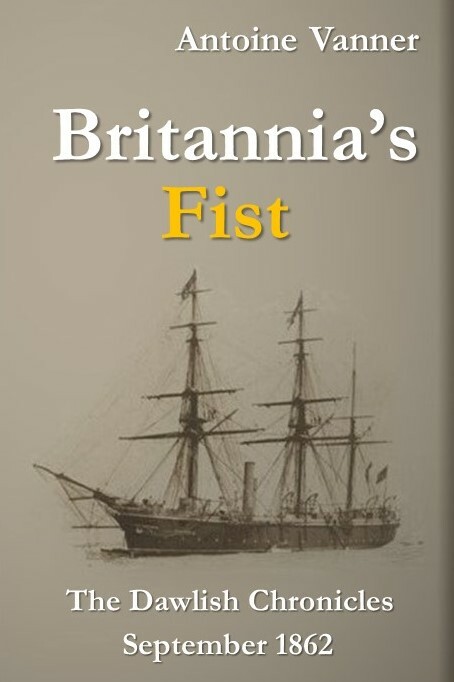 And down in the bowels of the ship, in the hot and steaming hell of the engine boiler rooms, a Chief Artificer was worth up to £136, an Artificer £95 to 118 and the Stokers, who had perhaps the worst job in the entire ship, were royally remunerated with £30 to 36 per year. What is particularly noticeable is the ratio of pay between highest and lowest, with the Admiral of the Fleet receiving , even before allowances, some 96 times as much as an Ordinary Seaman. It is pleasing to note that within 20 years of these words being written the apparently impossible occurred. Sir William Robertson (1860-1933), originally a house-servant, entered the army as a private soldier but rose to be a Field Marshal and was Chief of the Imperial General Staff – the professional head of the army – in World War 1. The process was slower in the Royal Navy. (An indication is given in the 1895 drawing above of a scene on a warship’s bridge: the officer is wearing boots but the seaman goes barefooted, a hangover from the Age of Sail). Sir Thomas Lyne, (1870- 1955) was the first man to rise from the lower deck to flag rank, joining as a “Boy” (at £9/2/6 per year!) in the 1880s and being promoted to Rear Admiral in 1931. The entire subject of pay, valuation of work, value of money remains fascinating one and the insights may be of value to anybody reading or writing about Victorian Britain. And one fact does stand out – even allowing for inflation in the eight decades between Pride and Prejudice and the above pay scales, Mr. Bingley would indeed have been a fine thing for Mrs. Bennet’s daughters!